Valentine’s Day is the time of year to pour your heart out to the one you love. Whether this be a crush, a boyfriend or girlfriend, or your spouse; February 14th is a day for you to express your true feelings. Valentine’s Day is a holiday that is full of traditions, both new and old. One lasting tradition is that every year lovers put together Valentine’s Day gifts with the hopes of wooing their sweethearts. Throughout history, the contents of these heartfelt gifts have changed, but the meaning behind them has remained constant. In the early days of Valentine’s gift exchanges, handwritten poems were the best way to court a potential lover. A poem can describe the feelings that you have when you see your loved one. Alongside these classic Valentine’s Day cards are flowers, whose beauty and scent have been used to impress others for centuries. In addition to these traditional tokens of love, there are more modern gifts that have become instant mainstays in the world of Valentine’s. One of the most recognizable V-Day gifts of the modern age is the Teddy Bear. With their soft plush bodies and their everlasting smiles, it is easy to see why we give each other these bears. Valentine’s Day bears are often found holding hearts to symbolize the love that we have for one another. They also usually have something written on them, phrases like “I Love You” and “Be Mine”. While these phrases are nice and sweet, have you ever wanted to make your Teddy bear gift a little more personal? Well you’ve come to the right place! 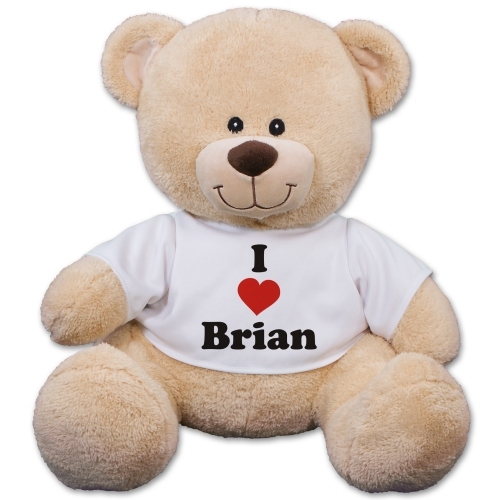 800Bear is your one-stop-shop for personalized Valentine’s Day Teddy bears that are sure to make your Valentine feel loved. Here are just a few loving Valentine's Day Teddy Bears that are sure to make their day! 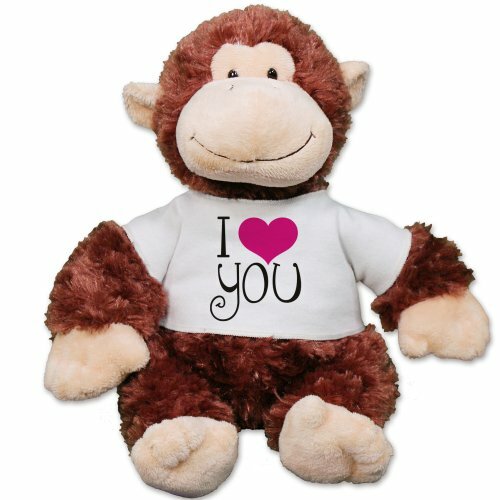 Embroidered I Love You Teddy Bear - 12"
At 800Bear, we recognize how important of a role stuffed animals play in people's lives. No matter what age we are, as humans we need comfort and security. Psychological studies have shown that people use inanimate objects to satisfy these instinctual needs of love and security. From little children carrying around stuffed animals to emergency crews supplying blankets to those who have experienced a traumatic experience, we use objects to make ourselves feel more safe. This is part of the reason why plush teddy bears are popular gifts for Valentine's Day. Since you may not always be there to comfort your loved one in person, a stuffed animal can serve as a legitimate surrogate and provide security when they truly need it. Shop all of our Valentine's Day bears to find the one that best represents the love you share!